This article is about the geographic region. For the university, see Eastern Washington University. For that school's athletic program, see Eastern Washington Eagles. Not to be confused with Eastside (King County, Washington). Eastern Washington is the portion of the US state of Washington east of the Cascade Range. The region contains the city of Spokane (the second largest city in the state), the Tri-Cities, the Columbia River and the Grand Coulee Dam, the Hanford Nuclear Reservation and the fertile farmlands of the Yakima Valley and the Palouse. 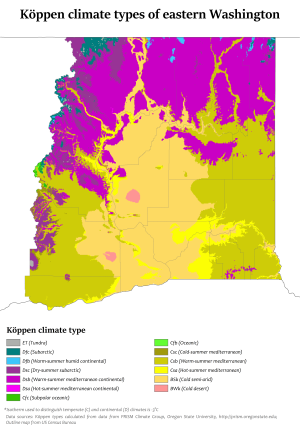 Unlike in Western Washington, the climate is dry, including some desert environments. A significant difference between Eastern Washington and the western half of the state is its climate. While the west half of the state is located in a rainy oceanic climate, the eastern half receives little rainfall due to the rainshadow created by the Cascade Mountains. Also, due to being farther from the sea, the east side has both hotter summers and colder winters than the west. Most communities in Eastern Washington, for example, have significant yearly snowfall, while in the west snowfall is minimal and not seen every year. The east and west do still have some climatic traits in common, though: more rainfall in winter than summer, a lack of severe storms, and milder temperature ranges than more inland locations. There is some variation in both rainfall throughout Eastern Washington. Generally, lower elevations are both hotter and drier than higher elevations. This is easily seen in the comparison between low-elevation Richland with higher elevation Spokane. The following cities and towns in Eastern Washington have over 10,000 inhabitants. Eastern Washington is composed of Adams, Asotin, Benton, Chelan, Columbia, Douglas, Ferry, Franklin, Garfield, Grant, Kittitas, Klickitat, Lincoln, Okanogan, Pend Oreille, Spokane, Stevens, Walla Walla, Whitman, and Yakima counties. Some definitions also include part of Skamania County that lies east of the ridge line of the Cascade Mountains. Compared to Western Washington, Eastern Washington has roughly twice the land area and one-fourth the population. According to the U.S. Census Bureau the population estimate as of July 2014 was 1,547,303. The population growth rate between the two is roughly the same. Of Washington's ten Congressional districts, Eastern Washington exactly encompasses two (the 4th and 5th), aside from a small portion of the 3rd in Skamania County. Eastern Washington hosts a number of world-renowned universities including three of the state's five public universities. There have been sporadic movements to create a 51st state out of Eastern Washington by splitting the current state down the Cascades, but proposals have rarely progressed out of the state legislature's committees. Bills in the Washington State Legislature which would have requested the United States Congress to take up the question were proposed in 1996, 1999, 2005, and 2017. Proposed names for the new state have included Lincoln, Columbia, Liberty, or simply Eastern Washington. Many of these proposals would include the Idaho Panhandle as part of the proposed state of Lincoln. Eastern Washington tends to vote Republican, whereas Western Washington usually supports the Democrats. Dry Falls in the semi-desert Channeled Scablands that dominate much of eastern Washington. ^ "SPOKANE INTL AP, WASHINGTON (457938)". Western Regional Climate Center. Retrieved March 11, 2018. ^ "SPOKANE, WASHINGTON (457933)". Western Regional Climate Center. Retrieved March 11, 2018. ^ "NOWData – NOAA Online Weather Data". NOAA. Retrieved March 11, 2018. ^ "Eastside Earthquakes Get Attention At Conference In Yakima". Oregon Public Broadcasting. October 17, 2007. Retrieved December 27, 2010. ^ Population figures are the most recent figures contained in the respective Wikipedia articles, or in the List of cities in Washington. ^ "WAC 222-16-010". Washington Administrative Code. Washington State Legislature. Retrieved January 13, 2018. ^ "Lawmakers want to make eastern Wash. its own state". USA TODAY. Retrieved January 10, 2017. ^ Hallenberg, Pia (February 12, 2017). "A 51st state, called Liberty, would have political clout and an ag-based economy". Spokesman-Review. Retrieved April 23, 2018. This page was last edited on 31 March 2019, at 20:42 (UTC).